Michaela Barratt, one of Jahana Hayes former students from Waterbury – opens a forum Sunday hosted by Students for Jahana Hayes. Concerned that they are often overlooked on the campaign trail, more than 50 college students formed a coalition whose aim was getting more young people involved in politics in Northwest Connecticut. 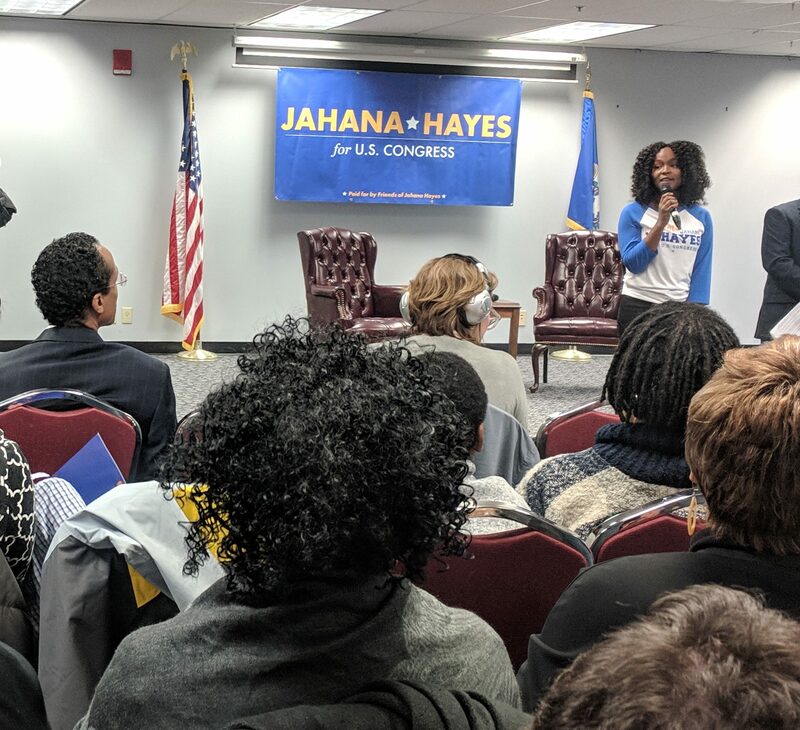 Jahana Hayes on Sunday credited these young people – dubbed “Students for Jahana” – for inspiring her commitment to become Connecticut’s first black female congressman. Hayes was a political newcomer and underdog heading into the Democratic Party’s convention, losing the nomination , under questionable circumstances, by a single vote. But in the subsequent primary, Hayes won convincingly, putting her on the Fifth Congressional District ballot against Republican Manny Santos of Meriden. “Young people dragged me across the line. 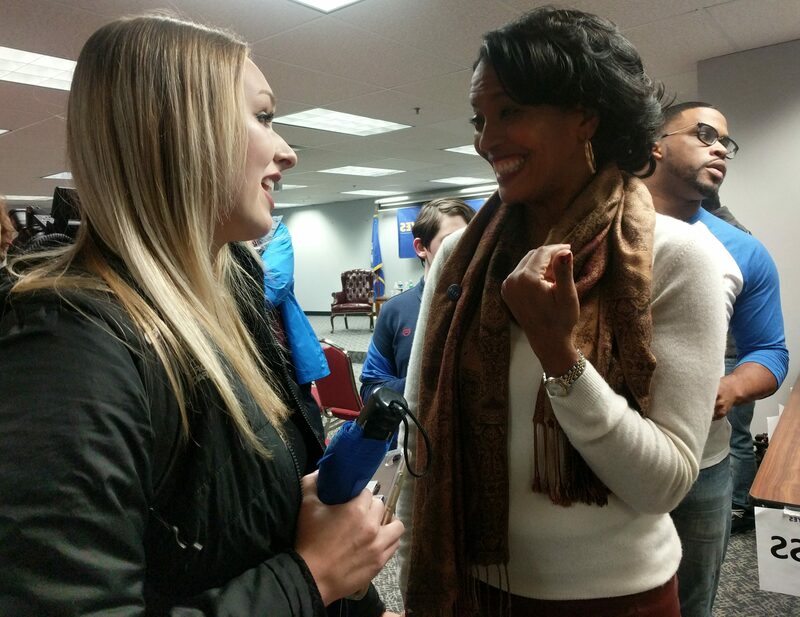 The polls had me out,” Hayes, 45, told a room of about 100 supporters during a forum for students at Central Connecticut State University’s New Britain campus Sunday evening. She said people told her to stop spending so much time courting young people because they don’t vote. Hayes – a former history teacher in an inner-city school in Waterbury who went on to become the National Teacher of the Year in 2016 – says the wave of politically engaged young voters continues to be her inspiration. They have registered to vote en masse. Since the last midterm election in 2014, an additional 4,877 new Democrats under age 25 had registered to vote in the Fifth District as of last Thursday – compared to 2,681 additional Republicans. Just over 8,600 young voters registered as unaffiliated with any party. Several new laws in recent years have made it easier for young people to register, including allowing people to register on Election Day at certain locations and having people register to vote while doing business at the Department of Motor Vehicles. However, there is still a major hurdle for some college students, some advocates have been warning. Many towns do not have more than one polling location, and proposed legislation that would permit towns with college campuses to open a second polling place on campus stalled this past year at the state Capitol. None of the college campuses located in the Fifth Congressional District have a polling place, said Hayes. Despite that, Students for Hayes hopes to change the narrative around them not showing up to the polls. Hayes has brought many of these students to volunteer on the campaign. Students are entirely responsible for helping those who need to vote absentee. And when she realized she needed a website – and after Googling ‘How to build a website’ wouldn’t suffice – Hayes turned to the students despite advice to turn the job over to professionals. 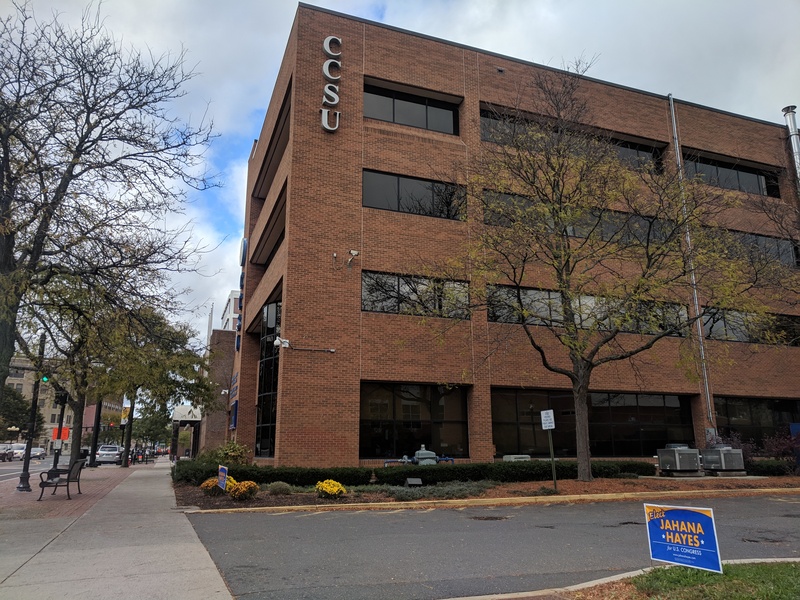 Central Connecticut State University\’s New Britain Campus with a sign supporting Jahana Hayes.